Around the world, hundreds of women infected with the Zika virus have given birth to children suffering from microcephaly or other brain defects, as the virus attacks key cells responsible for generating neurons and building the brain as the embryo develops. Studies have suggested that Zika enters these cells, called neural progenitor cells or NPCs, by grabbing onto a specific protein called AXL on the cell surface. Now scientists at the Harvard Stem Cell Institute (HSCI) and Novartis have shown that this is not the only route of infection for NPCs. The scientists demonstrated that the Zika virus infected NPCs even when the cells did not produce the AXL surface receptor protein that is widely thought to be the main vehicle of entry for the virus. “Our finding really recalibrates this field of research, because it tells us we still have to go and find out how Zika is getting into these cells,” said Kevin Eggan, principal faculty member at HSCI, professor of stem cell and regenerative biology at Harvard University’s Faculty of Arts and Sciences and Harvard Medical School, and co-corresponding author on a paper reporting the research in Cell Stem Cell. “It’s very important for the research community to learn that targeting the AXL protein alone will not defend against Zika,” agreed Ajamete Kaykas, co-corresponding author and a senior investigator in neuroscience at the Novartis Institutes for Biomedical Research (NIBR). Previous studies have shown that blocking expression of the AXL receptor protein does defend against the virus in a number of human cell types. Given that the protein is highly expressed on the surface of NPCs, many labs have been working on the hypothesis that AXL is the entry point for Zika in the developing brain. Working in a facility dedicated to infectious disease research, the scientists exposed two-dimensional cell cultures of AXL-knockout human NPCs to the Zika virus. They followed up by exposing three-dimensional mini-brain “organoids” containing such NPCs to the virus. In both cases, cells clearly displayed Zika infection. This finding was supported by an earlier study that knocked out AXL in the brains of mice. Historically, human NPCs have been difficult to study in the lab because it would be impossible to obtain samples without damaging brain tissue. With the advancements in induced pluripotent stem cell (iPS cell) technology, a cell reprogramming process that allows researchers to coax any cell in the body back into a stem cell-like state, researchers can now generate these previously inaccessible human tissues in a petri dish. The team was able to produce human iPS cells and then, using gene-editing technology, modify the cells to knock out AXL expression, said Michael Wells, a Harvard postdoctoral researcher in the Eggan Lab and co-first author. The scientists pushed the iPS cells to become NPCs, building the two-dimensional and three-dimensional models that were infected with Zika. The Harvard and NIBR collaborators started working with the virus in mid-April 2016, only six months before they published their findings. This unusual speed of research reflects the urgency of Zika’s global challenge, as the virus has spread to more than 70 countries and territories. 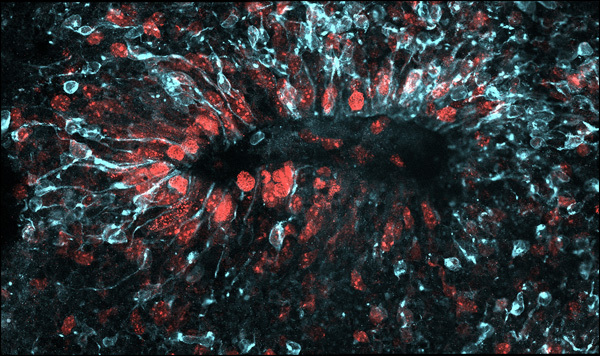 The collaboration grew out of interactions at the Broad Institute of Harvard and MIT’s Stanley Center for Psychiatric Research, where Eggan directs the stem cell program. His lab already had developed cell culture systems for studying NPCs in motor neuron and psychiatric diseases. The team at Novartis had created brain organoids for research on tuberous sclerosis complex and other genetic neural disorders. Story from Harvard Medical School. Original piece written by Hannah Robbins and Eric Bender. Please note: The content above may have been edited to ensure it is in keeping with Technology Networks’ style and length guidelines.